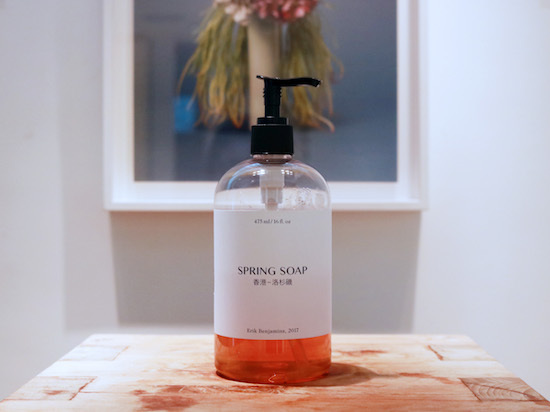 “Spring Soap,” a bespoke hand soap for the Spring Workshop washroom, is a product of—and a proposal for—making sense in the world as a smelling body. The finished project consists of a soap, a short story found on the soap bottle’s label, and messages on the walls. “Spring Soap” has been realized in two parts: the first (research) was spending two weeks at Spring Workshop, and the second (production) was working at the Institute for Art and Olfaction in Los Angeles. In late September, as an artist-in-residence at Spring, I explored smell as a literal and poetic definer of place. Across conversations, meals, walks, and writing, I valued the symptoms of the smelling visitor to move in Hong Kong and reflect on Spring Workshop, particularly in the twilight of its five-year mandate. Returning to Los Angeles, I began work on the fragrance with the support of the IAO. A list of materials (synthetic and essential oils) were compiled based on a few olfactory notes I had decided on after my time at Spring. From there, I began a laborious and near de-sensitizing process of testing and blending materials in different quantities and ratios to arrive at a fragrance for the soap that was (to the best of my abilities) well-balanced, compelling, and just a bit uncomfortable. I hesitate to describe the materials and their olfactory notes because we all know how much of an influencer language is. But at its best, the soap should be sharp, weird, refreshing, and decidedly Spring Workshop-ish, driven with aquatic notes and balanced out with some spice, some sweetness and some funk. When washing in water, the top notes (the most volatile scent molecules) will rush forward. But be sure to check your hands again after drying, and then a bit later still, to see how it’s changed, how the base notes rest on your hands. We’ve left some cards for you to share your thoughts, reactions, and associations. Please do take a moment to write because we are all capable of defining on our own terms how and why we make sense of the world. 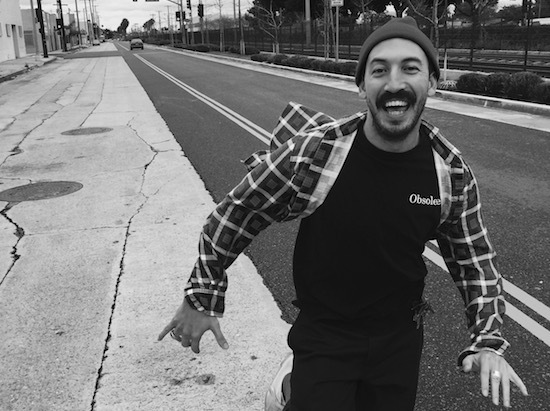 As an artist, writer, and educator, Los Angeles-based Erik Benjamins celebrates the sensing body as a means to move in the world. His practice is concept-driven, materially unfaithful, and unapologetically optimistic. From an experimental Florentine travel memoir to custom scented candles to a vanishing cookbook, Erik employs tenets of performance, namely a sensitivity to duration, body-to-body empathy, and a sensory spectatorship. Language and writing are also integral to the research, production, and installation of his work. Lately, he’s explored both the tourist and the homebody as privileged identities with which to learn from another.